It is with great delight that Diva Marketing is a stop on the virtual book tour for my dear friend Sybil Stershic's first book .. Taking Care of the People Who Matter Most: A Guide to Employee-Customer Care published by WME. Take Aways: Easy to read, Sybil's passion for the subject is evident, From concept to how to do it, Smart, Elements of social media e.g., transparency, inclusion - breaking down silos, conversations critical, A must read for everyone in management and those who aspire to those positions. I hope you enjoy reading my conversation with the author of Taking Care of the People Who Matter Most: A Guide to Employee-Customer Care - Ms. Sybil Stershic. Toby/Diva Marketing: The phrase “Internal Marketing” sounds so .. well warm and fuzzy .. not very strategic. However, from Chapter 1 you set the stage that Internal Marketing is grounded in ROI with this quote from Francis Hesselbein – “Dispirited, unmotivated, underappreciated workers cannot compete in a highly competitive world.” Let’s set the record right. On a high level, what is Internal Marketing? Sybil Stershic: Internal Marketing is a strategic blend of marketing and human resources focused on taking care of employees so they can take care of customers. While that still sounds warm & fuzzy, nonetheless it’s critical because if your employees don’t feel valued, neither will your customers! Toby/Diva Marketing: How does it differ from Internal Branding? Sybil Stershic: Internal Marketing is based on the self-reinforcing relationship between employee satisfaction and customer satisfaction, whereas Internal Branding is based on making the brand part of the organization’s operations to ensure employees deliver on the brand promise. While management may use Internal Marketing to address employee and customer satisfaction and/or retention, internal branding is more likely to be used when launching a new brand or revitalizing an existing one. Those differences aside, both approaches recognize “the brand walks around on two feet” and, as a result, are focused on engaging employees for marketing and organizational success. Toby/Diva Marketing: Your book not only details the many aspects of Internal Marketing but provides a tangible work path, from an Internal Marketing audit to where people can develop a customized strategy. a beginning audit to an Internal Marketing Action Plan. Looking at the Internal Marketing Audit checklist where do you find companies fall short? Why? and can you offer a few suggestions? Sybil Stershic: Surprisingly, they fall short in remembering to communicate the organization’s overall goals and what’s expected of employees in helping achieve those goals – reinforcing where each employee fits in the scope of the company and how the employee impacts its success. For most companies, it’s an issue of time and, in some cases, inertia or neglect. The company gives out job descriptions to new employees, introduces them to the company in orientation, and then it’s back to business as usual. The company keeps plugging along and assumes that employees are up to speed with what’s happening in the organization. Meanwhile, face-to-face staff meetings have become almost nonexistent as they’ve been replaced by a barrage of e-mails. Here’s what I suggest: managers need to develop a checklist of information that new employees need to know (especially in firms too small to offer a formal orientation) PLUS a checklist of regular information that all employees need to know, such as where the company is headed and what its strategy is for getting there, etc. Managers who aren’t sure where to start with this can ask employees (those who have been with the company for a while and those who are relatively new): What information do you think new employees need to know about the organization? What do you know now that you wish you learned as a new employee? What type(s) of information do you need to stay updated with what’s happening in our company? Toby/Diva Marketing: What have you seen is the biggest challenge, from management’s viewpoint, in developing a successful Internal Marketing program? Sybil Stershic: The reality is Internal Marketing is more than a program – it’s an ongoing effort. And it’s one that’s best implemented gradually rather than introduced as a new “flavor-of-the-month” management initiative. I find it ironic that many companies who do Internal Marketing well aren’t necessarily aware that they’re using Internal Marketing. These are companies with a workplace culture and operations committed to the value of both customers AND employees. For managers and employees who are not part of such companies, the challenge is to apply Internal Marketing despite members of management who don’t get what it’s all about. The good news is you can still have a positive impact by applying Internal Marketing on a “micro” basis – at the department or division level – if not throughout the organization. Sybil Stershic: It depends on the manager or management involved. Recognition is genuine when it’s given by a manager who is respected by employees. Toby/Diva Marketing: Let’s look at Internal Marketing from the employees’ viewpoint. How can employees contribute to the success of an Internal Marketing strategy? Whether applied formally or informally, Internal Marketing includes any and all initiatives, activities, and programs that connect employees to three levels: to the organization, to customers, and to other employees. For example: orientation, recognition programs, customer or employee roundtables, training, departments coming together for a combined staff meeting, job shadowing, customer and/or employee appreciation events, etc. Back to your question on how can employees contribute to the success of an Internal Marketing strategy. They can best contribute by being open and honest with management regarding how they feel about the organization and what they can do to help it succeed; in addition, they should also share any feedback they get on how customers feel about the company and its brand(s). Toby/Diva Marketing: It seems an exciting benefit of an Internal Marketing strategy is, call it a cross pollination among traditional corporate ‘silos.’ Would you please talk a bit about how that occurs? Sybil Stershic: Earlier I talked about employees needing to know where they fit in the ‘big picture’ of the organization and how they can contribute to the company’s success. This is not done in a vacuum, however, as employees need to know how their work impacts others within the organization, including “internal customers” – employees whose needs must be met in order to serve the company’s customers. So I advocate opening up communications within as well as across departments. Some companies do this by encouraging employees to trade places or ‘shadow’ another employee to better understand that person’s job function. Departments can also host an “open house” (in real time or online) to showcase what they do. At a minimum, you can begin to break down organizational silos by opening up your staff meetings to other employees. (There I go again pushing staff meetings!) Seriously, such activities serve to create empathy and appreciation for other employees. Toby/Diva Marketing: Let’s wrap this up by talking about the next generation work force. How do you think the Millenniums will impact the future of Internal Marketing? Do they expect a different work environment then the XYers or the Boomers? Sybil Stershic: I believe there will still be a need for Internal Marketing as the work environment and workforce continue to evolve. Here’s why. Despite different generational attitudes in the workplace, companies will still need to engage their employees. And that’s where Internal Marketing comes in – enabling organizations to communicate and reinforce a sense of common purpose, a sense of belonging, and a sense of being part of something special, particularly in workplace that’s becoming increasingly insular. Internal Marketing will continue to be relevant as a ‘high touch’ people-centered management approach in a ‘high tech’ world. Thanks, Toby, for allowing me to share this with your readers. Special Discount! WME is kindly offering a 20% discount when you purchase Taking Care of the People Who Matter Most: A Guide to Employee-Customer Care from the WME online book store. Please the code 107VBT on the checkout page. Lisa Rosendahl, HR Thoughts, posted a great review. Chris Bailey, Bailey Work/Play: The Alchemy of Soulful Work, shared insights in his review. Kevin Burns, Burns Blogs Attitude, provides his views about about Taking Care of the People. On June 6th, Becky Carroll, Customers Rock!, gives us a two for one .. an interview and a review. On June 9th, Paul Hebert, Incentive Intelligence, will review Sybil's new book. Diva Special Treat! The first person who drops a value-add -to-the-conversation comment (as determined by Sybil herself!) will win a copy of On The Virtual Book Tour - Taking Care of the People Who Matter Most: A Guide to Employee-Customer Care. More Sybil: Catch Sybil on the Diva Marketing Talks podcast when she dished with me and Nettie Hartsock about being a new author. "A little piece of history in the making" is what Lois Kelly, one of the newest story tellers calls Blogger Stories. Blogger Stories is a special blog that I launched to tell the stories of how people have been touched by blogs, podcasts, vlogs and other online interactions. The virtual library is almost at 90 "chapters" that have been contributed by bloggers from all over the world. The little website with the odd name is influencing lives more than one might imagine. For the three new blogger story tellers blogs renewed interest and gave new meaning to their career directions. The next time you're on a boring conference call .. don't doodle. Read a Blogger Story! Want to tell your Blogger Story? Drop a comment and I'll send you the details. In keeping with stories, it's been a media kinda day for me. I was quoted about blogs and social media in articles about two different industries, financial and food/restaurants, that are stepping into the world of people talking to people communication. Restaurant News, Restaurants wade into social media to hook virtual customers written by Liza Berger. Unfortunately a subscription is need to access content on the site. Thanks to BBF Stephan Spencer for the introduction to Liza. Growing up in Boston made my interview with Jesse Noyes, of the Boston Herald, a special treat. Jess wanted to understand why and how organizations are tapping into bloggers for his story - Wainwright Bank plans a meeting with liberal bloggers. Very interesting that a financial institution is developing a program that solicits bloggers' feedback. However, in more "banking culture" than "bloggy culture" the bank is not revealing much about its strategy. Josh Ourisman, who writes the On The Other Hand blog, was asked to the party. He was also asked to extend the invitation to join Wainwright Bank's bloggy talk to Boston/Cambridge/Somerville progressive bloggers. I'm not sure what progressive blogger means. However, I can't help but wonder if Wainwright Bank is also developing relationships with bloggers in their target market which might include business owners, homeowners (there is a village in the blogosphere that focuses on home ownership not to mention a lively real estate community) and non profits. Since Wainwright Bank is monitoring the social media buzz I'd like to extend an invitation to Steve Young, or any of the bank's folks to drop by and give us a few lessons learned about their blogger relations program and if they launch a social media initiative I'd love to know that too. In the meantime toss of a pink boa to an innovative financial instituion. One more thought to ponder. This post is an example of how a story can go from a traditional main stream media source, a la the Boston Herald or Restaurant News, to a blog where the information is further extended and virally pass along. Hmmm, girlfriend, can't help but wonder how many of MSM (main stream media) are building blogger relations programs. Perhaps they should take their cue from a traditional industry like banking (wink). And so dear divas and divos the media lines continue to blur. Where oh where is the heart and soul of Starbucks? How can Starbucks get its groove back? I’m sure you’ve heard about the leaked Howard Schultz memo to key Starbucks executives. In this memo, Howard derides decisions the company has made in order to grow. Howard closes the email by asking his executive team to get smarter about the business and to get more innovative to once again differentiate Starbucks. Taking blatant inspiration from Seth Godin’s WHAT MUST GOOGLE DO ebook done a few years ago, I’m doing a WHAT MUST STARBUCKS DO ebook. It’ll be totally free and posted somewhere online for all to download. And just as Seth did, I’ve asked people to send me their ideas on what Starbucks must do to become the company it once was. The crux of this ebook will be the ideas generated by the "Starbucks Board of Customers." Thanks for asking me to play along .. Here's my 2 cents, which we know won't even buy the opportunity for a deep breath of java aroma at SB. Ooops.. there is none! Starbucks built its success on the warmth of the experience more so than the excellence of the coffee. The neighborhood coffee shop where "everyone knows your name" or your coffee of choice must begin with the baristas and ends with the baristas. The in between details are the foam on the java that should reinforce the sense of local community. My suggestions to would begin at marketing 101 - understanding your customers and their needs. That might result in jazz nights with area musicians or cookies from an area bakery instead of a corporate buy. Or it might mean a play area for kids with moms in one city or more outlets for laptops in another neighborhood. It might even mean giving up some of the 'corporate' cookie cutter standardization. I wonder if Starbucks is really ready to "be" that neighborhood shop once again? If you want to play along all the details are on the What Must Starbucks Do post at Brand Autopsy. I want to tell you a customer service story that does not have an ending. It is a true story that could happen to any company. In addition to the fact that I'm sure Capital One would not want an unhappy customer, what makes this even more important for the organization is the visibility the situation has been given on Mrs. Garfield's highly popular blog. I would encourage you to read the comment sections as well. MyMomsBlog has been highlighted in main stream media publications like the Washington Post and the Boston Globe. The word-of-mouth influence, online and offline, could be significant and damaging. Your organization might consider contacting Mrs. Garfield and posting a comment on her blog that offers a solution. My thoughts are that Mrs. Garfield's situation with Capital One is one that many other people are experiencing. In this new world of easy online publishing (blogs, podcasts, vlogs) that reach not a few, not a hundred, but thousands of people with a click and then spread virally, it is becoming critical to listen and join our customers in their discussions. I wonder what Mr. S did with the email from a stranger. I wonder if he hit delete. I wonder if he forwarded it to his boss. I wonder if the company who made the Fortune 100 Best Places To Work List will care about one customer. It just so happens that one customer is an 81 year old Divine Diva whose blog has the reach and influence of more than many main stream media vehicles. A reminder: not all consumer generated media casts a negative veiw of a product or service. That brings up another question. What do you do when something good happens to bring postive buzz to your brand? What would your mother tell you to do if someone said something nice about you? Why thank them kindly I'm sure! What is important is social media is impacting how companies conduct business .. even if those companies don't know it. Which in turn influences how your brand is perceived. Which in turn develops customer loyalty. Which in turn makes the cash register ring. Which in turn keeps your share holders happy with increased ROI. Which in turn puts smiles on your employees since they have jobs. Which in turn might get you on Fortune Magazine's 100 Best Companies To Work For List. I wonder how this story will end .. or if it has ended. Thanks to Gaping Void for the graphic. 2. Lists. Lee Owden has a gone a step beyond the recent Z-list meme, launched by Mack Collier over at the Viral Garden, and posted his 250 Must Read Blogs. Some are proably Z some are A some are LMNOP. Then Lee, in true Divo style, went a step futher. He put the whole deal in alpha order and included a blurb about each. Not only a must check out but cool viral marketing strategy. 3. Interviews. Yvonne DiVita has been running an interview series called Smart Woman/Smart Man/Smart Couple since June 2004. The series provides great content and insight and I'm betting an added benefit is the great networking that gives Yvonne with an opportunity to meet some interesting people. 4. Niche. Nichelle Stephens writes one of the yummiest niche blogs .. Cupcakes Take The Cake. 5. Hints. Darren Rowse, ProBlogger, has to be The Divo when it comes to the how and what to drving traffic to your site. Trillions of hints and idea. 6. Book Clubs. Marketing Prof's blog, Daily Fix is running a book club complete with free books. The Diva who thought of this bright idea ..CK. The first book will kick off on Jan 10 with Jackie Huba and Ben McConnell's Citizen Marketing. Shoot CK off an "e" <[email protected]> if you want to play along. Toss of a pink boa to Ann Handly for letting the "community" take over! 7. Marry A Famous Blogger. But then you have to prove your blogging is worth a click and a read. Maryam Ghaemmaghami Scoble, Maryamie, wins that contest. 8. Continuing Series. Lewis Green, biz solutions, is asking readers to send photos of family and friends who have served in the military. Here's something that touches the heart. He's posting the photos on Thursdays. 9. A Little Controversy. Amanda where are you? Amanda who are you? 10. A Little Delight. Millie Garfield, My Mom's Blog, is smart, charming and the youngest 81 year old I know. Now Millie is giving vlog Yiddish lessons! 11. A Little Satire. With Kat Herding Media Jeneane Sessum and Chris Locke show how to make a point without taking social media too seriously . 12. A Little Appreciation. Nancy White, Full Circle, has thanked all of her commentors. Not only has she thanked them but she has linked to each on of them .. if you click to see .. this was no small task! 13. Innovation. Rajesh, BlogWorks, is on a mission to bring social media to India. 14. Information. TDavid, Things That Make You Go Hmm, provides tons of geek stuff often with photos to accompany his posts. 15. Guest Bloggers. Donna Lynes-Miller, Gourmet Station's Delicious Destinations, has invited a wine consultant, customers and an owner/chef of a B&B - who have a passion for Tuscany and a butler from England to pop in and share the spotlight with T Alexander. 16. Carnivals. Wayne Hurlbert is the Divo, or shall I say, the Carinval Barker, of this one. 17. Nice. Paul Chaney .. one of the kindest bloggers around .. and one smart dude. 18. Write Books. Shel Israel,Global Neigho[u]rhoods is on his second, Debbie Weil claimed a niche, Andy Wibbels reinforced his positioning. 20. Contribute To A Blog Community. Many great bloggers are writing for Business Blog Consulting, BlogHer and Daily Fix. 21. Hold a Blog Conference. Sherry Heyl is chairing an unconference, SoCon07 in Atlanta on Feb 10. 22. Memes. Those little games that you either love or hate. Been tagged twice more for the Five Things You Don't Know About Me meme. Don't want to bore you again but since Nettie Hartsock and Des Walsh are 2 fav blogger how about a couple of what-you-don't-know about Max? Max turned 6 on January 4th. Happy Birthday puppy! Max is the most un-alfa terrier I've ever met. Even the vet says that. Max is the biggest little pest. Persistance must he Max's middle name. He paws until he gets what he wants. Max is finky and will only eat certain doggy treats. His favorite are Greenies and Chocolate Drops. Bloggy Transparency: #1/18 and #14 are social media clients; and I have some sort of affiliation with the other #s .. but girlfriend, I am not married to a famous blogger (#7). Hope that covers the disclosures. Happy weekend .. off to pour that Trader Joe 3 buck chuck cab (I know it's 2 bucks every where but in Hot'lant)! Astro Divas off are celebrating 2007. They'll be back next week. Girlfriend, one of my most fav movies - holiday or not - is Miracle on 34th Street. I even like the new updated version; but the film with Maureen Sullivan and Natalie Wood is still The Classic Christmas Flick - a little romance, a little conflict, Santa, children, imagination, hope for the future and simple miracles. However, it is also one of the best lessons in customer service. Favorite Miracle on 34th Street quote: Faith is believing when common sense tells you not to. Don't you see? It's not just Kris that's on trial, it's everything he stands for. It's kindness and joy and love and all the other intangibles. Miracle on 34th Street offers a great lesson in customer service and in the philosophy of social media marketing. For your reading pleasure, here is a post I'd like to share with you from the 2004 Diva Marketing archives. Enjoy .. and happy holidays to you and yours! It was Christmas 1947. Before blogs, buzz marketing and building online community strategies. The CEO of a major retail organization briefs the company's ad department. "No high pressuring and forcing the customer to take something he doesn't want. We'll be known as the helpful store. The friendly store. The store with a heart. The store that places public service ahead of profit. The plan sounds idiotic and impossible .. consequently, we'll make more profit than ever before." With those words Macy's Department Store launched the most innovative sales program ever viewed...on the silver screen. It was a Miracle on 34th Street. Fast forward 59 years. The use of the internet is one of the most exciting sales and marketing strategies we've seen in the last 59 years. However, in this model there is no room for high-pressure sales techniques. The customer is in control of the sales experience. The customer is also in control of the marketing message. Include a blog strategy to an internet marketing mix and yet another dimension is added. The company steps out from behind the shadows of traditional PR, customer service and research (all valid in their own right) and declares it's ready to listen and learn from prospects and customers .. on the their terms. It's not afraid (ok. perhaps there are a few wobbles) to show the world that there might be a few warts. That's a giant step from old world marketing to open communication new world marketing. The plan sounds idiotic and impossible .. consequently, we'll make more profit than ever before. As the year 2007 approaches, high-tech developments spin even faster taking the possibilities of internet marketing into areas that were impossible in '47 or '57 or even '06. Imagine a site that holds current inventory and pricing, allows for on-line financing and results in better, faster cheaper processing. Imagine a site that allows for product customization. Imagine a site where you can start a conversation with a real person about what matters to you regarding a product or service. Imagine a site where you can talk to a real person who doesn't respond with an FAQ list. Imagine a site where you can actually help change the direction of a product or service before it's even launched. Imagine a company that doesn't close the door (or comment section) to you or your ideas. It's interesting to compare a 1940's film, where finding solutions to customers' problems was perceived as unique, to 2006 where finding solutions to customers' problems is considered ingenious. And with that I wish you and yours a very merry holiday season! Sidebar: Take a cue from Diva Marketing <wink> dusty off your classic posts .. with a little polish and updating they will take on a fresh new read. Take time to relax and have some fun after being harried from working and then shopping and decorating and wrapping packages and, on and on. It maybe difficult to get anything accomplished this coming week after the Christmas Holiday and then preparing for New Years Eve festivities. On Wed. Mercury enters Capricorn. The mind has a chance to settle down and focus on practical matters like “How on ea rth am I going to pay for all of those presents?” I wish everyone Many Blessings, Happiness and Joy this holiday season. Sidebar: Special joyful wishes to my dear Astro Diva Bloggers friends Paula & Donna who have put a unique spin on Diva Marketing's Friday Fun. Girlfriend, I ask you where else in the biz blogosphere can you find business astrology? Great print ad from AstraZenca. My favorite lines - "We'll be the first to admit we don't have all the answers. But as a pharmaceutical company, we recognize that when you trust us to help you, we feel we owe you the same trust in return." To me that implies mutual respect. After the last Diva Marketing post, it's nice to see that some marketers get that good marketing does not = customer manipulation. From the website AZandME.com - "This web site, AZ&Me, is our first step toward realizing our goal of creating a more personal, more positive healthcare experience. Are we there yet? Certainly not we've only just begun. What we are wondering now is, where do we go from here?" AstraZeneca, glad you asked. How about a step into social media with a blog or a podcast or two or how about a vlog that brings the static content to life? Toss of a pink boa to AstraZeneca for taking the first steps in understanding that the new world of marketing means building relationships with customers not jumping through trick hoops. 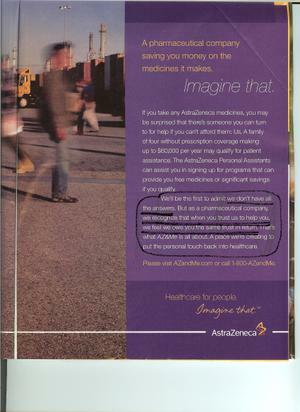 Sidebar: Let's take a from AstraZeneca. What can you do to let your customers know that you trust and respect them? So very bloggy! When you're on the road for business, eating alone seems more the norm than not. Most times I'm okay with that. I use the time to catch up on "thoughts" or people watch and write blog posts in my mind that will probably never find their way to Diva Marketing. But Girlfriend, sometimes it can be lonely and awkward. Last week my plane was late getting into Phoenix, where I was speaking about using blogs to build better service relationships, at the ASU's Compete Through Services Symposium. I was tired, hungry and a little frazzled when I walked into the Bistro at The Ritz Carlton Phoenix (sometimes these speaking gigs do have their perks!) to have dinner. As the waiter showed me to a table for one, two women, who were having dinner, waved to me and invited me to join them. Barbara Glanz turned out to be the end key note speaker and Krista Leintz was an attendee. Little Acts of Kindness. And little did I know that Barbara Glanz's kindness would be a living example of her presentation - The Simple Truths of Service. Barbara is passionate about building customer loyalty through customer service. As Barbara told us, you can't mandate customer service. Excellent customer service comes from both the heart as well as the head. That usually doesn't just happen. The culture of your organization has to support and encourage Little Acts of Kindness. I listened to her tell story after story of creative, but simple ways, people within companies engaged with their customers. Barbara tells people to, "Put you personal signature on the job." Then there is Johnny The Bagger a young man who happens to have Downs Syndrome. Johnny puts a though of the day in every order he bags. Customers come into the store, patiently wait in Johnny's line, just to get Johnny's quote of the day. "Johnny brought his heart to his job. He focused on what he could do in his daily work to make his customers feel special and their lives a little better." Little Acts of Kindness. Light bulb moment. This is so bloggy thought I. Why not incorporate blogs into your customer service strategies? Why not have a Johnny The Bagger Blog? 1. Great Service Inspires Stories/Memories. Tip: Understand the choices you have to engage with your customers. Teach employees to look for these touch points. Tip: Management must first have a focused vision and be enthusiastic about the importance of excellent customer service. Tip: Everyone in your organization is responsible for creating Little Acts of Kindness. Bottom-line .. your customers have click-of-the-mouse choices. From the heart customer service builds stronger relationships and can differentiate you from your competition. Little Acts of Kindness .. works! Lessons Learned: Let's take our cue from Johnny The Bagger. What little Acts of Kindness can you implement in your business that will make your customers feel appreciated and special? In doing so you will not only create a much needed point of difference for your business, but a memorable "signature." I'd love to hear what you're doing. Please drop a comment and share your experience. Happy Friday Diva fans; this could be a very interesting weekend for many of us. The planets are lining up asking us to have a good time, Moon in Leo shouts let loose, play enjoy life from one corner with the other team of players in Scorpio wanting intensity passion and focus. You may have plenty of homework to do on your business agenda but feel like throwing it to the wind until you are back in the mood. Set aside allotted time to focus and regroup your long term vision, then allow your inner child to come out and play.